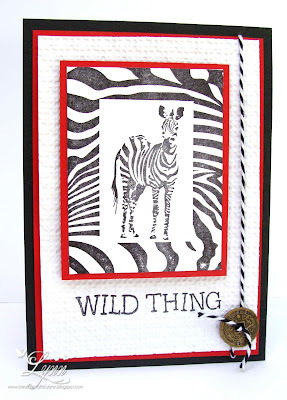 Since I had a "Friday Funny" on Wednesday this week, thought I'd just post a WILD THING card! I know, I know....another red, black, and white card - what can I say! This is a stamp that I won from the Repeat Impression challenge and when I picked out the image I didn't have any idea what I was going to do with it - but liked it. 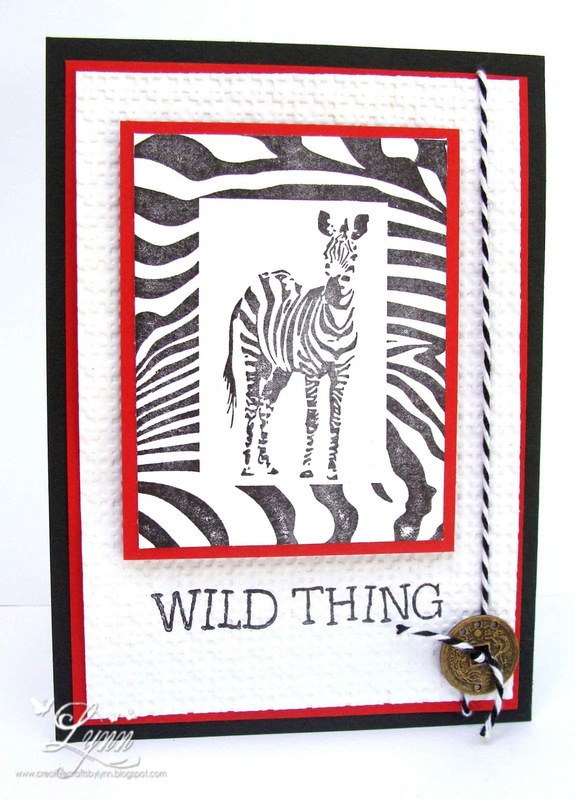 I like how the card turned out but really wish that I had embossed the black "frame" around the zebra. 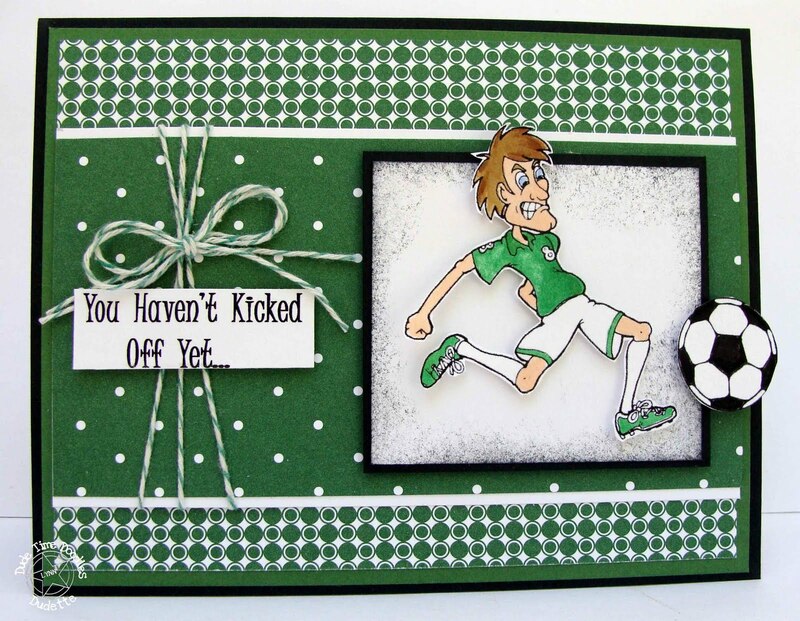 But this is normal for me - just about every time I get a card done, I see things that I wish I'd done differently. Maybe we're all like that though. 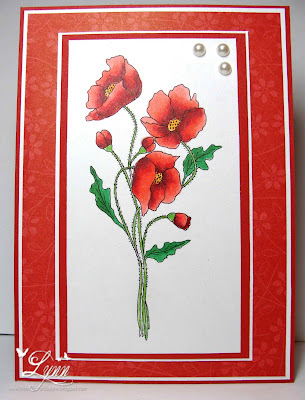 The sentiment is from CTMH and I used the Square Lattice embossing folder from SU on this. The coin was in a box of buttons and goodies that a friend gave me that had belonged to her mother. It was full of coins of all type and some very unique buttons. She was a world traveler and picked up bits and pieces of all sorts of things in her travels. I'll enter this in the ABC Challenge (Zoo) and Die Cut Dreams #94 Challenge (Animal Antics - animals with four legs). Thanks for stopping by..............Have a wonderful weekend. 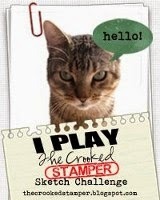 First of all, I'd like the say a great big THANK YOU for all that played along in the Stamps R Us Blog Hop. 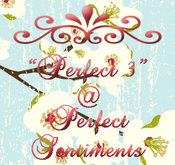 It was a lot of fun and I appreciate all the wonderful comments you left on my blog. I read each and every one of them. 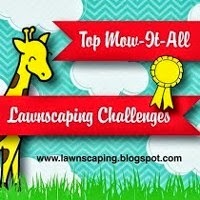 Hope you had as much fun as we did with this Blog Hop. I'd also like to say "Thanks" to all the fabulous sponsors we had. Ok, so I know everyone is waiting to hear who won..........right! 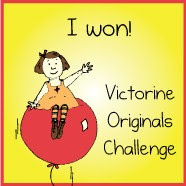 AND - on my blog...........the winner is MEGAN - who won an Arcylic Stamp Set from Inspired Stamps! We will be in contact with all the winners soon to tell you how to claim your prize. PLEASE NOTE......you'll notice that there are 4 PRIZES THAT HAVEN'T BEEN ANNOUNCED! 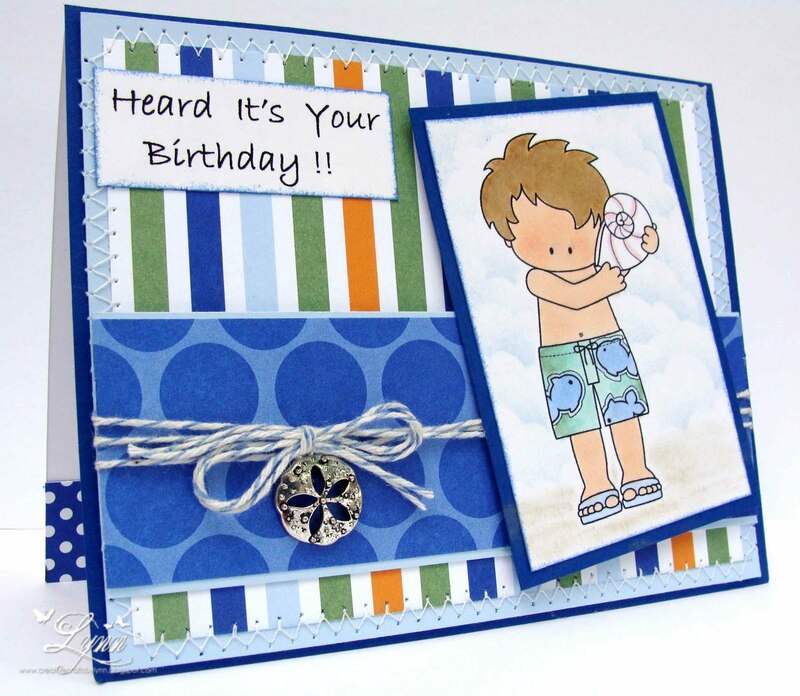 Those will be given to the Top Blog and the Top Three in the Stamps R Us Challenge (theme of Birthday) that is going on right now. 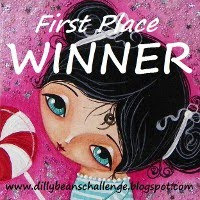 The Top Blog will win a $10.00 gift certificate from Whimsie Doodles - and the Top Three blogs will be awarded the prizes from Tiffany Doodles (2 digital stamps) , Bugaboo ($30.00 Gift Certificate), and Color Me Creative Classroom (1 Suzanne Dean Copic Class)! So BE SURE and head on over the the Stamps R Us Challenge and enter for your chance to win one of these wonderful prizes. Anne, Janet, Cleota, Michelle, Ruth, NanaConnie, Boni, Dawn, Lynn (that's me), Linda, Chrissy, Tammy, Ginny, and Dude Time Doodles. This handsome gent is know as Chick Sanders and as you can see, he's really just pretty much of a "leg man" but as the inside of the card says "will take whatever you're dishing out"! 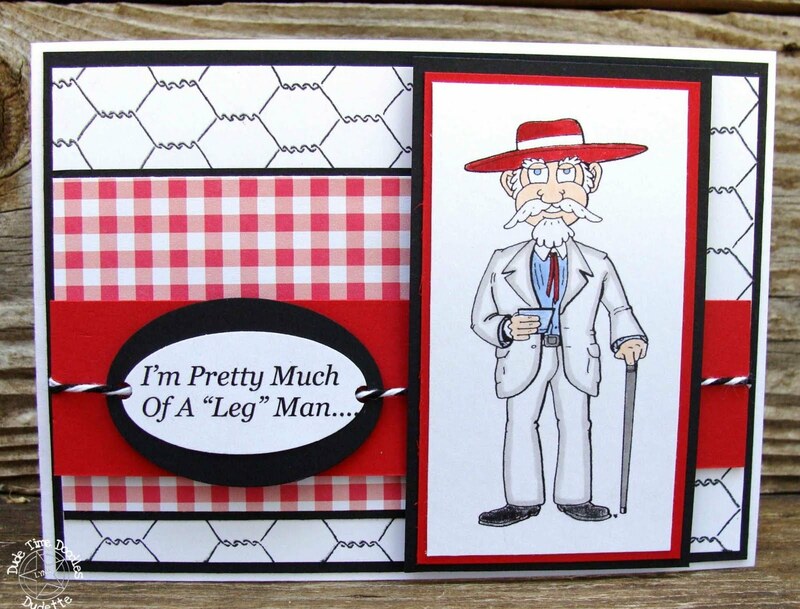 Of course with a name like Chick Sanders, he reminded me of Col. Sanders - thus the chicken wire background. I actually MET the real Col. Sanders a LONG time ago. Get ready to roll you eyes and get a chuckle here.........I was on a TV talk show out of Austin, Texas because I was one of the candidates for Rodeo Queen from a nearby small town!! No, I didn't win (came in second) but did get dolled up in the boots, cowboy hat, and all the rest. (See I TOLD you, you'd be rolling your eyes!) Anyway, the Col. was on the same talk show and I have to tell you, he looked exactly like the pictures you see of him. Anyway.........carry on with the Hop now, check out all the new release images at the Dude Time Doodles store, and have some fun. 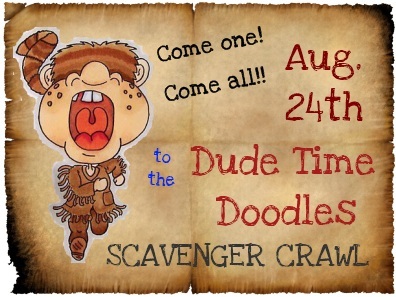 Also, don't forget about the 1 year Birthday Bash Scavenger Crawl on August 24th for Dude Time Doodles. 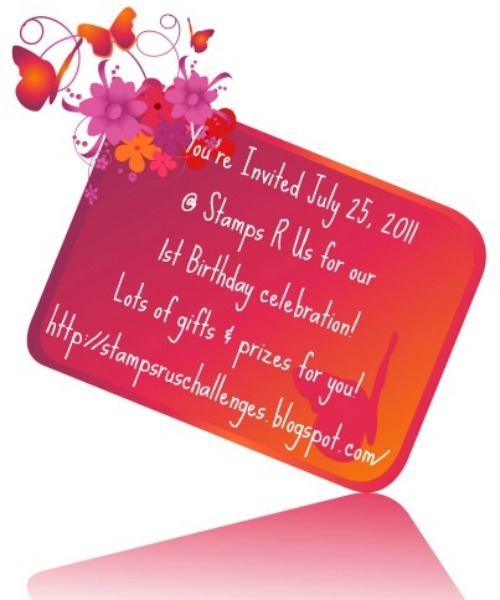 The Stamps R Us Challenge blog is now officially one year old and do we ever have a Birthday Bash for you! 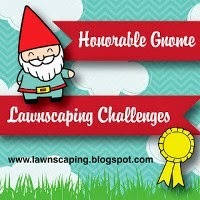 Not only do we have our regular challenge but also a whale of a Blog Hop. The challenge for the next two weeks at SRU has the theme of "Birthday". Is that easy or what! 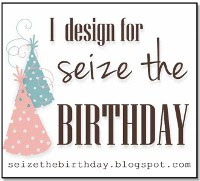 Our sponsor for the challenge is Whimsie Doodles - AND to help celebrate our birthday, they'll be giving our fans a 10% off coupon good for 30 days from the start of the challenge. For your shopping pleasure, the code for the 10% discount is SRU10. 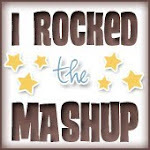 Now, for the Birthday Bash Blog Hop........ We have a FANTASTIC list of sponsors! I'm going to list all the sponsors but please go to the SRU Challenge blog to see all the fabulous prizes you can win - just make sure you're sitting down when you do this because you just won't believe it!! 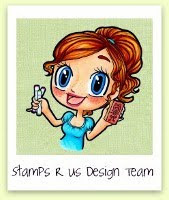 Sponsors are Inspired Stamps, K n K Designs, The Stamping Boutique, Cardmadfairy's,Squidgi Digi, Michelle Perkett Studio, Tiffany Doodles, Clear Dollar Stamps, Bug A Boo Stamps, Through the Craftroom Door, Color Me Creative Classroom, Bizzy Bec's, Oozak, and Whimsie Doodles!!!! Be SURE you leave some love on all the DT sites as we will EACH have one of the prizes drawn from our comments. 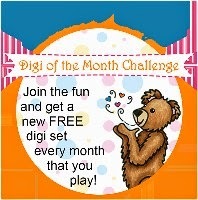 Also enter the challenge as there will be more prizes there. 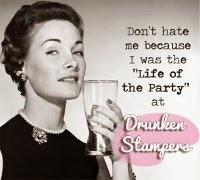 If you came from Kathy's Lucky Stamper blog you're on the right track. 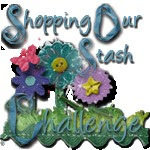 Be sure and check out the SRU Challenge blog to get the entire list of all the DT members so you can comment on each of the sites and also get a list of the SUPER prizes. We'll announce the winners on Thursday. Your next stop on the Hop is MARILYN at One Stamping Fool. Challenges: Paper Sundaes (beachy or Summer), The Pink Elephant (Fun in the Sun) and Corrosive Challenges by Janet (All about Kids). 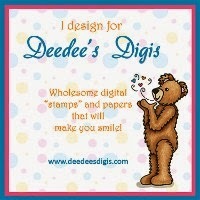 Hope you enjoy my little card using one of the Whimsey Doodles images.......Now have fun on the HOP! 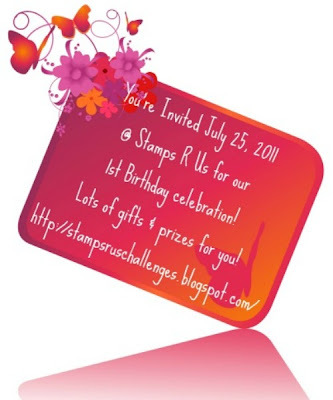 Just a reminder that the Stamps R Us Birthday Bash Blog Hop and the Challenge begins tomorrow! 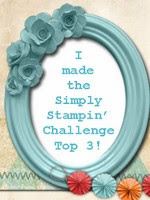 Be sure and stop by my blog in the morning (Monday) and then check out the Stamps R Us Challenge blog. You will be AMAZED at the sponsors AND the prizes that are being offered. It's another Funny Friday around here! Hope this makes you smile. 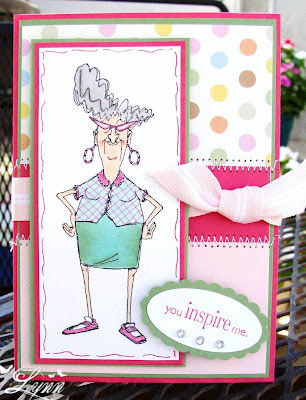 Meet Eunice from Art Impressions Stamps! Is she not a doll or what. I just love the smile on that happy face and guess she's thinking about all you wonderful ladies (and gents) that inspire her daily! I'll enter this in the challenge they're having this week with the challenge being sewing - either real or faux. 1. My feet are not even close to being as big as Eunice's....I wear a size 4 1/2 shoe (for real)! 2. No dresses for me - unless I just have to (that's the nice thing about getting old.....you can wear what you want!) 3. My hair usually looks like this in the morning when I wake up and it really is that blasted gray color too! Yikes. . 4. I actually have some earrings that are almost as large as Eunice's but my ears aren't this long - yet!. 5. The wonderful glasses she's wearing - I do wear glasses but it's been a few years since they've looked like this. 6. My husband always calls me "chicken legs" since my legs are so skinny - so I really do have something in common with Eunice! 7. Last but not least, after looking at everyone's blog each day, I usually have a smile this big since you all inspire me and I always receive so many lovely comments. Thanks for stopping by........and have a smiling weekend. Bonibleaux Designs and Dude Time Doodles Are Turning One! We will be celebrating with some fun events. for our first annual Scavenger Crawl. 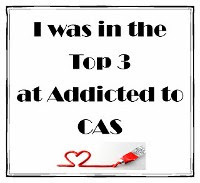 Please grab the badge and post it to your blogs. Help us spread the word. 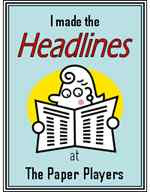 There will be prizes, special guests, prizes, and great fun had by all. 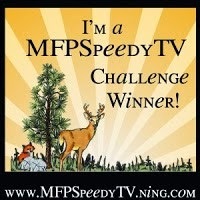 Oh, and did I mention prizes? This is one little mouse that won't cause you to holler "EEEK"! I'm really not into cuddling mice by any means since, welll...after all, they ARE a rodent - but - Cocoa (from Sweet n Sassy) stamps is just one I'd LOVE to cuddle. Isn't he adorable! So rodent or not, he's a "keeper".. I kept seeing all the wonderful little Cocoa images over on Carol's Our Little Inspiration blog and immediately fell in love with him. 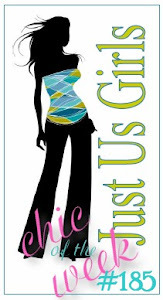 This is just one of several images I purchased from Sweet n Sassy. Every time I'd see one of Carol's card using Cocoa, I'd say "there's that mouse again". Well Carol......here's that mouse again! The sketch I used for this is from The Sweet Stop and I'll be entering this in their challenge - sketch with a spin: Christmas in July. 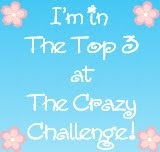 Two other challenges that have the theme of Christmas in July are Paper Sundaes and The Crazy Challenge. I'll also enter my little Cocoa in those challenges as well. 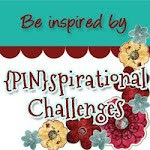 It's time for the Inspiration Challenge over at Dude Time Doodles! Yeah! 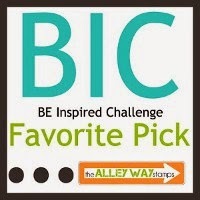 You have one week to submit your project and who knows...you could be named the Top Blog or one of the Top Three for the week. Just remember it MUST be a masculine card as that's what the dudes are all about! 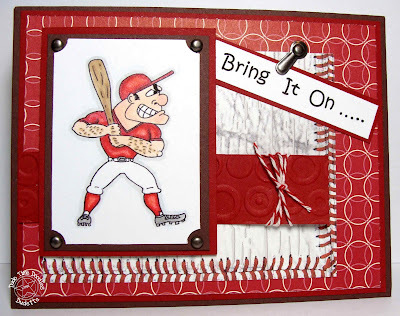 This is RBI Robby (a cute little baseball "hottie" by Bonibleaux Designs)! The entire time I was making this card I kept singing "Take Me Out to the Ball Game".........does anyone (besides me) remember all the words to that one? LOL! I really don't care for baseball that much but will watch the World Series. It's just not fast paced enough for me I guess....I DO like to look at all the cute baseball players though!! (As hubby says, "I may be old, but I'm not dead yet!) This will be a birthday card for one of the guys in the family....inside it says....another BIRTHDAY, that is. 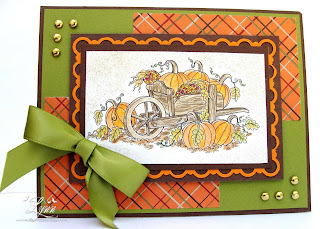 I have another card to post later today that may make you say "EEK"! But stay tuned, because on Friday, we'll just have to have another Friday Funny! I'll be entering this in the challenge over at Here Come the Boys - their theme for the challenge is "Sporty". Thanks for stopping by........and be SURE and enter the Dude Time Doodles inspiration challenge. 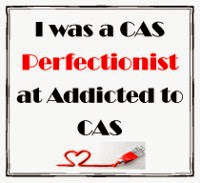 Just stopping by with a CAS card on this nice HOT Monday to say I hope everyone has a wonderful week. And you're probably already "dreaming" about Friday - right! The butterfly and background is from a set called Flores Suaves from SU and can be found in the Spanish catalog. I've seen Jaydee use this stamp set several times and finally decided I NEEDED it! 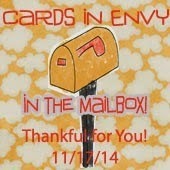 If fact, my card is very similar to several of the ones she did. It's a very pretty set that not only includes the butterfly and background, but also a single rose and a bee. The "Dream" sentiment is from Inkadinkadoo. 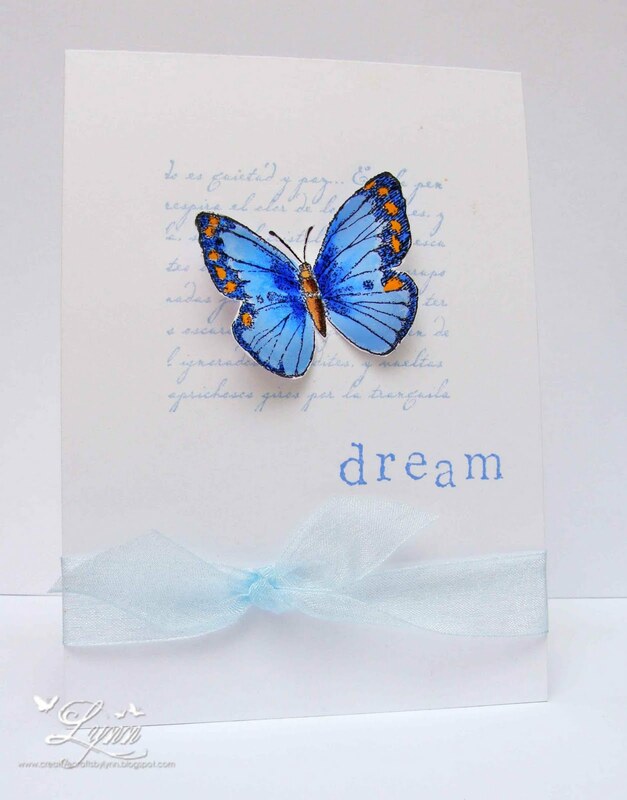 I'll enter this in the challenge at Paper Play Challenges (theme: things with wings). Don't anyone get real excited because I still love my Prisma pencils...however...I did purchase a few more Copics the other day and am in the process of learning how to use them. So many use this color medium and all the creations tend to be gorgeous so I thought I'd give it a try and maybe some of that gorgeous-ness will rub off on me! LOL! I'm pretty sure I've viewed every video made on how to use these things and was still having such a hard time. So, I purchased this wonderful book (Copic Coloring Guide) and must say I'm loving it. For a beginner like me it sure is coming in handy and hopefully I'll get the hang of it soon. After seeing Jan's card using this image, I decided to take the plunge and try my hand at it. Mine is no where close to being as pretty as hers but....I'm learning and I guess that's what it's all about. Also, Dana, has been so much inspiration with her lovely coloring with Copics...take a look and you'll see what I'm talking about! I'm not REAL happy with the card (but am happy with the coloring for a first shot at this). I was going to stamp a sentiment at the base of the flowers but was just too plain "chicken"! It took me forever to get this thing colored and I wasn't about to mess it up trying to stamp a sentiment on there straight! LOL! I just used some GP card stock from Walmart for this this image - but will be doing all the ones in the future with Cryogen paper - Tammy was so gracious to send me a couple of sheets of this to try and I love it. Thanks again, Tammy. So a big SHOUT OUT to these three ladies - and all the rest that color so pretty with Copics! Thanks for all your inspiration. Thanks for stopping by.............and have a great weekend. It's the second Wednesday of the month and that means it's time again for another Dude Time Doodles FREEBIE! Head on over there today and grab your free image - then submit your entry using the freebie for a chance to be the next Guest Designer on Dude Time Doodles!!!!! How cool is that! This is Rocco Soccer and what a better time for a soccer image than right now! The World Cup soccer matches are in full swing and if I'm not mistaken, I believe the US Women's team faces off again France tonight. I really don't understand the complete rules of soccer but anyone that can keep bouncing that ball off their head and not getting their brains scrambled, has my vote! It looks like Rocco is in "full swing" also.....just a good thing he hasn't kicked off (you DO know what I'm saying here I hope) just yet. On the inside I have - "So have a Happy Birthday"! Thanks for stopping by and be SURE and check out Dude Time Doodles and grab this cute little free image. Who knows....you may be our next Guest Designer! Fetch a Sketch is having a brand new sketch challenge today and Dude Time Doodles is the wonderful sponsor. 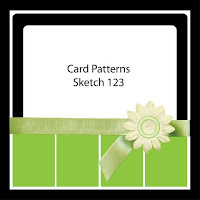 Be sure and head over to Fetch a Sketch and enter for your chance to win a fabulous prize. The image (that you can find at the Dude Time Doodles store) is named Fanny Fart, but, to me, it's just Joy Beth! A little story here........Six years ago - right after my husband and I had gotten married - I finally met his sister, Joy Beth, and her husband. I was very nervous about meeting her - not knowing if she would like me, if I'd fit into the family, etc...Anyway, after we'd finished eating dinner I was helping her clean up and as she walked through the kitchen, she "cut a little windy"!!! As soon as she did, she turned to me and rather sheepishly said...."It runs in the family"!!! LOL! I didn't know whether to laugh or what! But inside, I thought I'd die I was laughing SO hard. Joy Beth and I have gotten to be very good friends now and we always laugh about this. The image looks so much like her it's not even funny! She dresses to match - all the way down the the shoes, purse, rings, and even her watch band! 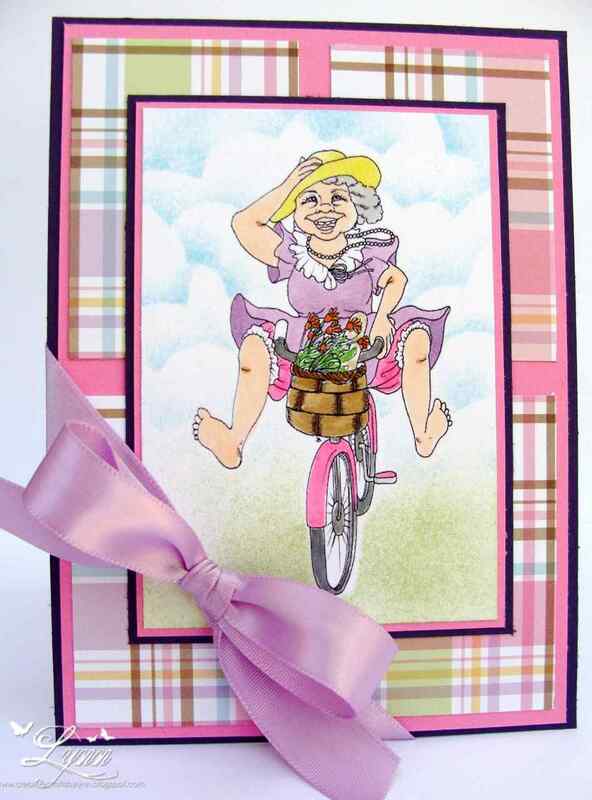 This card will be sent to her TODAY. 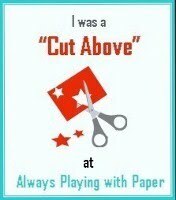 ( A little PS here - the I used the bubble embossing folder on the red background - what more can I say (LOL)! Thanks for stopping by.........and have a great week. 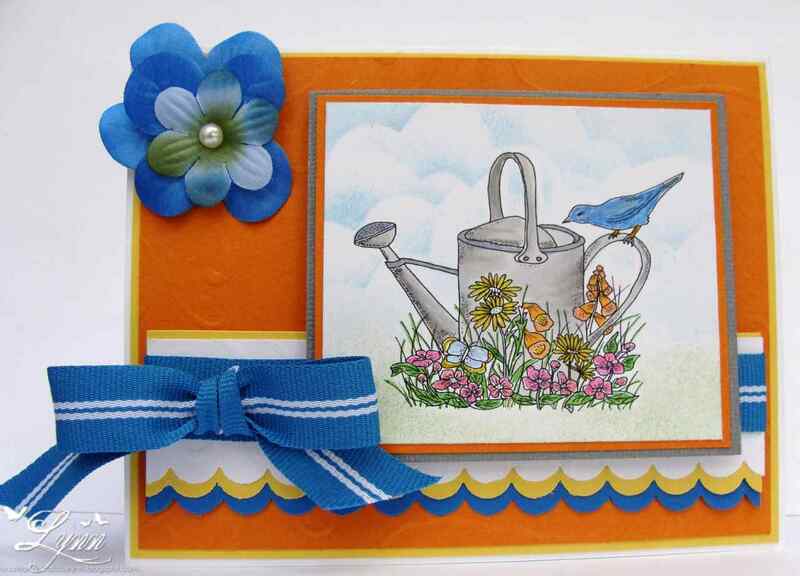 It's time for another challenge over at Stamps R Us - the theme being "through the garden gate". 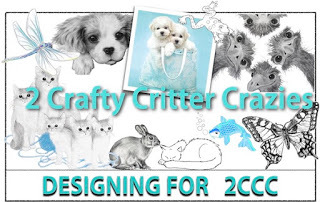 You have two weeks to play along with this theme and the winner will be awarded a wonderful prize package from our sponsor this week, Heart Song Designs. 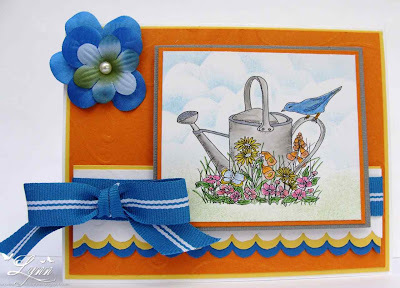 This little watering can is just one of the many pretty images she has. Be sure and check out all the DT creations and also the Heart Song Designs store. I colored this image with Prisma pencils and used some Pacific Point blue, Pumpkin Pie and Daffodil Delight. A very pretty image and will make a wonderful card for someone special. Thanks for stopping by......and head over to Stamps R Us Challenges. 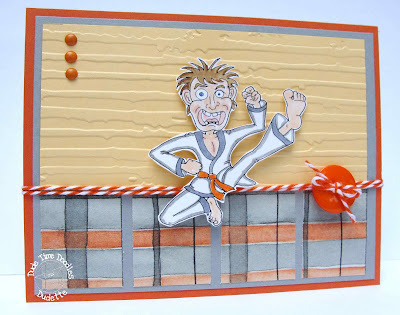 Dude Time Doodles is the sponsor for the fabulous sketch challenge blog at Card Patterns this week and we're so excited about that! 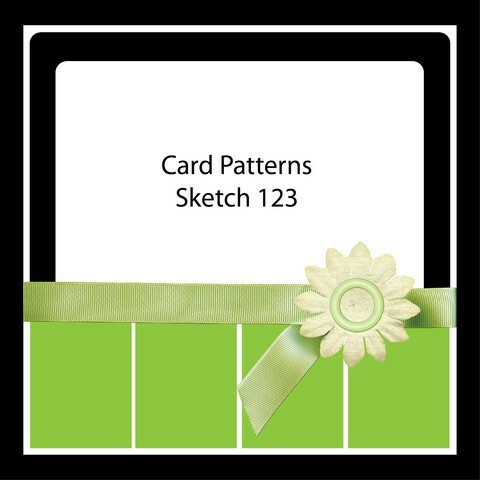 This is just a wonderful sketch so be sure and stop by Card Patterns and enter for a chance to win a great prize! This is Kyle Karate and he's such a cute little guy and looks like he's ready to kick some......well, you know. This image would make a wonderful card for one of the dudes in your life and you can find him at the Dude Time Doodles store. Now I know everyone is still trying to figure out what the heck Atemi (the title of this post) means! Well, since I knew NOTHING about karate, I decided to look it up and found that Atemi is the art of striking vital points! Kyle looks like he's either struck some vital points on someone - or maybe someone has struck a couple of vital points on him!! LOL! Be sure and head over to Card Patterns to see all the wonderful creations by the design team - and then submit your entry for the sketch challenge. Well, ho, ho, ho!!! 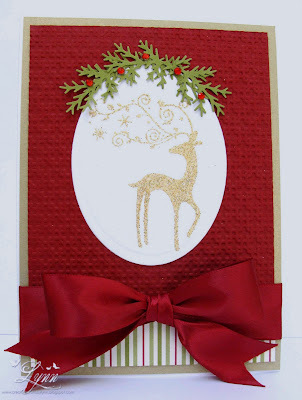 My card yesterday was a Christmas card and here's another one! So, we'll have one funny and one that's just pretty (hopefully). 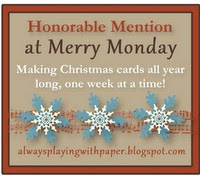 And the best part about this is that I've just completed two more cards for Christmas! 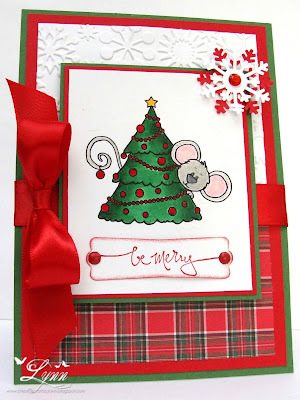 This one is for the challenge at The Paper Players (theme-Christmas in July).and Creatalicious Challenges (sketch). I've used Dasher from SU and paired it with some of that wonderful Cherry Cobbler that I ran though the Square Lattice embossing folder. This is matted on some Gold card stock and the image is heat embossed in gold. I used a MS punch for the "holly" and added several red rhinestones to top it off. I don't have any idea where this ribbon came from but it matches that Cherry Cobbler perfect! Now I know that tomorrow is Friday - but I won't be posting a Funny Friday then.....I do have a cute one coming up on Saturday though and another one on Monday (that is such a "toot") AND ANOTHER one for Wednesday (that you'll get a "kick" out of)! Are y'all getting tired of funny cards around here? Hope not! It's time for another one of those wonderful Dude Time Doodle sketch challenges!! Head over there today and enter your creation for a chance to WIN! 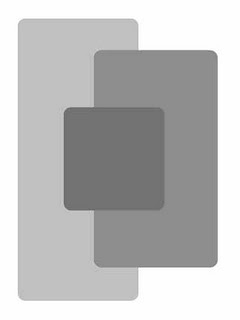 Our sponsor for this challenge is Creative Inspirations Paints. 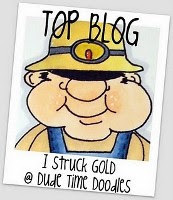 Anne has a great tutorial on the Dude Time Doodles site and on her blog on how to use this fabulous paint. You have one week to flip the sketch, twist the sketch, work the sketch and submit your entry. You not required to use a Bonibleaux Design image, although it makes us happy when you do. It MUST be a masculine themed creation though as that's what the Dudes are all about. Be sure and check out all the wonderful creations by the design team (that you can find on my side bar). Also, pop over to Boni's STORE and grab some of those wonderful images....so much fun. 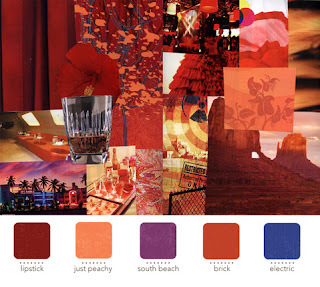 This image is called Santi Beaches and you've seen me use it before. It's just too cute not to use though. 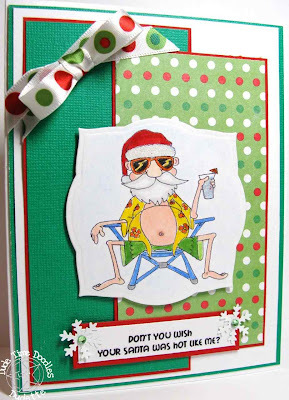 And, as the sentiment says, "don't you wish your Santa was hot like me"! LOL! Wouldn't this be a great image for someone special at Christmas? I just love his little belly sticking out and he could really care less about how he looks....he's cool, comfy, and got his favorite drink - to heck with all the hustle and bustle of Christmas shopping, etc! Be sure and check out the Dude Time Doodles sketch challenge and submit your entry. Just a really quick card this afternoon. Tammy, over at My Craft Central, is having one of the OWH Virtual Card Party challenges and her theme is "Color Me Crazy". As soon as I saw it I thought of this cute cow image from Stampabilities. So yesterday, I had some time and decided on what I was going to do...it had sewing on it, a lot of bling, and was oh so cute - in my mind! And then hubby walked in and reminded me I needed to make a birthday card for one of his nieces - like YESTERDAY! 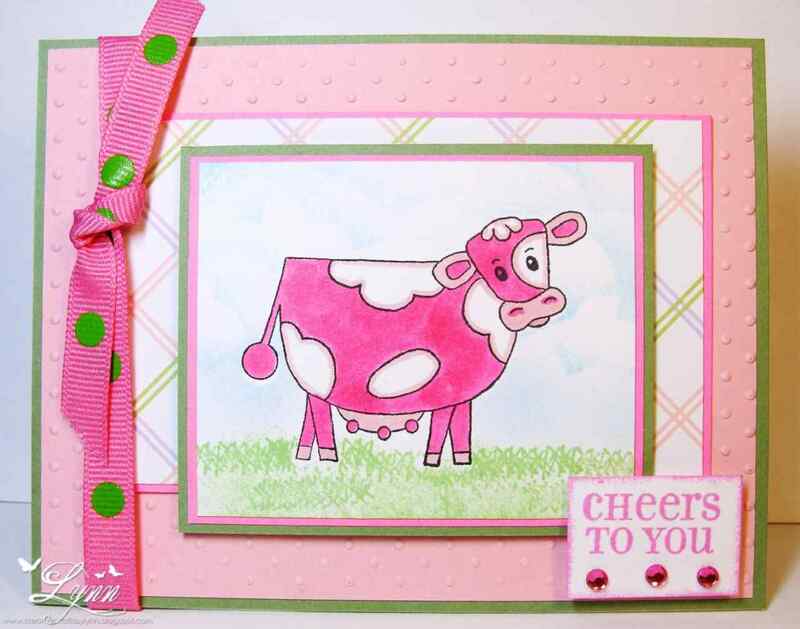 So very quickly I made this pink cow card! He looks like he drank too much pink lemonade for the 4th! LOL! 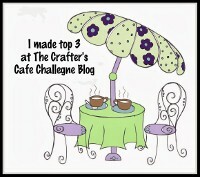 Stop by Tammy's blog and enter the challenge with a "Color Me Crazy" creation. 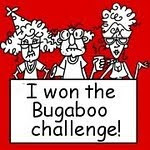 And by the way, the winner will receive some Bugaboo images!!! I do love those cute images. HOPEFULLY that Mr Linky thingy will pick my number. We've already had over a month of 100 plus temps in this area it seems and when it's that hot I like to make fall and winter cards - kind of cools me off! This is an image from Karen's Doodles - which, by the way, is having a DT call right now. No, I'm not throwing my name in the mix for a chance on the DT but I do love all the images she has. 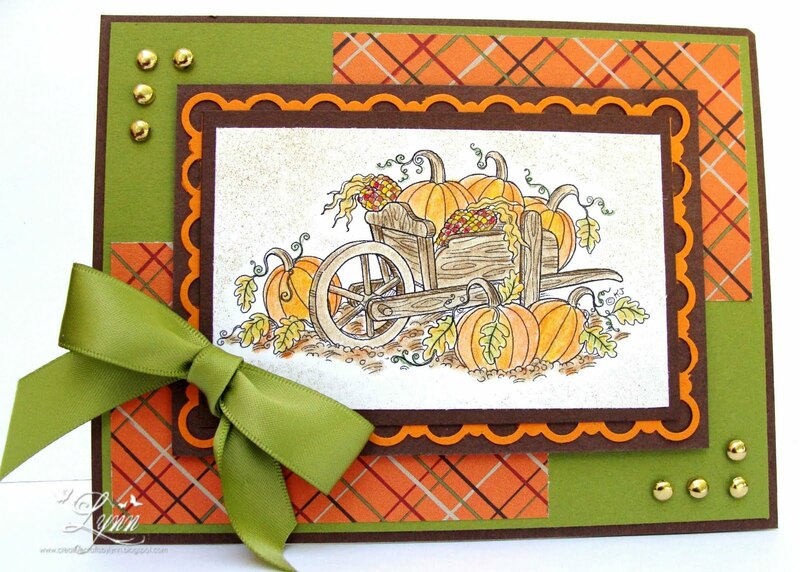 I used some Chocolate Chip, Old Olive, and Pumpkin Pie card stock (see, I'm telling ya, we're talking FALL here)! I also a couple of SU punches for the frame. Pretty basic card, but I really like how it turned out - or maybe I just like the "cool" feeling it gives me. Here we are with another "Funny Friday"! This is not really a funny card - more of a FUN card I think. 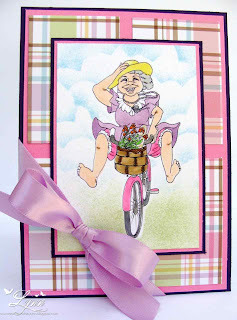 Love this little gal on her bike with her loaf of bread and flowers in the basket. She really does look like she's having fun. I'm thinking this image is from Beccy's digital images - but not sure. I've had if for some time and just never used it before. I'm finally about to get all the digital images organized but still have a few that I'm not real sure where they came from. Check out the clouds on this!! SO proud of myself - even though I know I'm in need of A LOT more practice. A tutorial for making clouds can be found HERE. Anyway, hope you enjoy the card and maybe it'll put a smile on your face for the weekend! 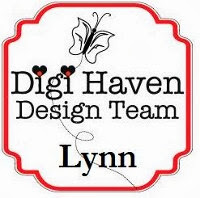 Hi, my name is Lynn and I enjoy all aspects of cardmaking and paper crafting. I am retired and loving every minute of it!